Whether you're thirsty for adventure or hungry for new experiences, this is the place to discover all the most up-to-date happenings from the very heart of Lightwater Valley. From our upcoming theme park events to our latest news stories, such as planned attraction installations you're definitely in the right place. Our news and event feeds will always be updated with the latest information, so remember to bookmark this page and to check back regularly so you don't miss out on the best content that's hot off the press. Got something to say? Looking for somewhere to share your opinions on the news of the day? Then head over to our Facebook or Twitter pages and let's get interactive. 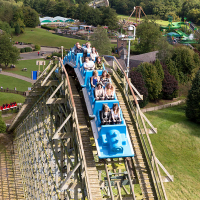 We'd love to hear what you think as we value all your opinions and feedback - and don't be afraid to post your best pics and videos from your day out at Lightwater Valley. Things to do in North Yorkshire this Father's Day! Sublime Science Week this May Half Term!